Earlier days,your blog post URL couldn't be set before publishing your blog post.Blogger automatically generate URL for you from your post title.Most times our title have much more characters (40 and above) which automated URL could't include.As all you know URL play a vital role in Google Search Engine,so that to get good keyword included URL , I was creating URL first and then content next. 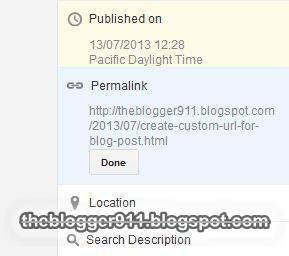 But some day before, Google introduced new option to create Custom URL in New blogger interface. That means,before publishing the post itself ,you can see and edit the post URL according to your wish. Login to your Blogger account. And click on 'Create new Post' button (Pencil signed ) to open your Blog Post Editor. At right side of Post Editor, Click on Permalink button. Add your URL in provided text field. After customizing URL, Click on Done Button and Publish your post. It sounds good that blogger have started to add some SEO tools these days.